There are so many brands out there, how do you choose? We are aware that there are hundreds of baby brands available for every different parenting need. It seems sometimes there are as many baby brands as there are baby names. A LOT. Some traditional, some popular, others new and upcoming. Again, like baby names. With both my children I have gone with products recommended by other parents. Chosen based on a brands commitment to delivering the safest and best designed items with the well-being of your little one in mind. 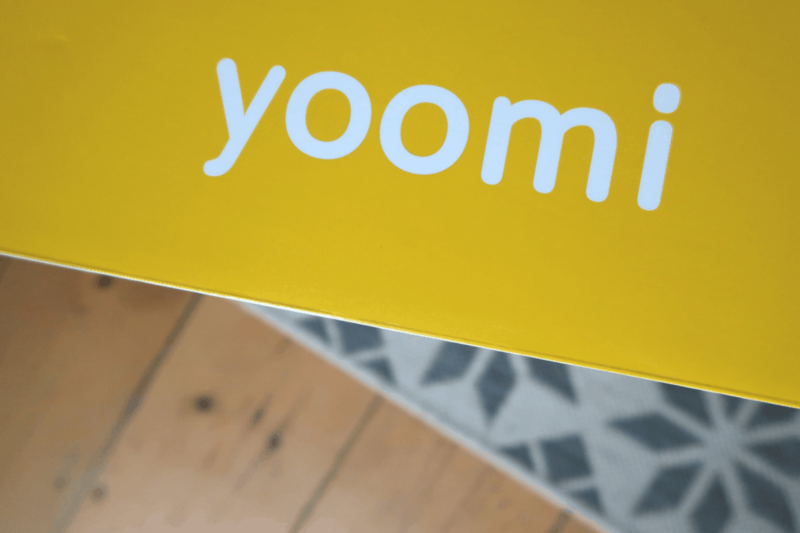 Yoomi is the brainchild of parents Farah and Jim; an award-winning British nursery brand with innovative expressing, feeding, warming and sterilising solutions. It arrives in a yellow storage box which you could tell has been carefully designed to be simple yet attractive. The Yoomi teat is made from super soft silicone and has a natural breast shape (just like mum) to promote easy latch. The teat doesn’t sink when faced with a powerful sucker and is available in 4 flow rates. Norah is used to Tippee bottles and took to it happily. With 6 air vents to reduce colic rather than the standard 1 or 2, air that flows back into the bottle is drastically reduced so little tummies are happy. An extra wide neck makes preparation and cleaning easy. The BPA and phthalates-free, premium grade 5 plastic, exceeds UK, EU and US safety standards. The bottles are lightweight and durable, the 8oz option being perfect for self-holding. For the creative parent you can customise and build your own bottle. The warming system. ANYTIME, ANYWHERE. Norah when she gets hungry, has cues like all babies but moves from fine to ravenous in 10 seconds. By the time you have the kettle boiled and bottle warming she is hysterical. You can use a microwave but its best to avoid this to risk overheating the milk and the nutrients getting damaged. Fed up of stumbling around at night trying to heat the bottle? Trying to get a breastfed baby to transition to a bottle? The Yoomi self-warming bottle is a game changer! The warming pod is simply screwed to a Yoomi bottle and with a touch of a button heats milk to the perfect temperature (32 to 34ºC) in just 60 seconds. Just what you need for those 3am night feeds. That’s faster than a Perfect Prep machine and perfect for both formula or breastmilk. Welcome to hassle free, quick and easy feeding! A nice touch is that it stays warm for up to an hour for those slower drinkers. What features do we love about the Yoomi bottles? Conventional bottle warmers will warm the entire bottle of feed and bacteria within will start to multiply immediately. If baby takes an hour to drink its feed, the bacteria has had an hour to multiply. The Yoomi warmer warms the feed as baby drinks, minimising bacterial growth. Unlike other methods, there is no second guessing whether the temperature is correct, Yoomi warms to perfect breast milk temperature every time with no hot spots. Just to be extra safe, the lovely people at Yoomi added a food grade colorant so that any leaks of the warming solution are visible. Convenient – This is for me the best product to travel with a baby. Offering ready to feed milk there is no need to request cups of boiling water in cafes that your seven-year-old son can knock over. Also, there is no need for plugs or batteries so Yoomi offers the most practical solution to feeding on the go! If you follow the set instructions it is simple to charge up, but it does take a couple of goes to get the hang of it. You would need a few chargers if you were out for a long day. Note: Before use you will need to wash and sterilize the bottle and charge the pod! So don’t buy and take it straight to a wedding or picnic etc! Is it worth playing for a lie in or a hassle-free outing? The pod can be recharged 300 times (lasting approx. 6 months) so think of it as 300 lie ins and hassle-free outings! The importance of sterilizing! Yoomi vs Tippee. Previously we had a Tommee Tippee electric steam sterilizer. It was compact, with a quick cycle but was restricted to five bottles. A con was that I regularly had to clean burnt milk residue off the hot plate. I felt unsure that the five-minute cycle was a deep enough clean option to eliminate the germs and bacteria that breed in milk and ensure complete bottle hygiene. The Yoomi steriliser was designed so that parents no longer must compromise between hygiene and speed. A versatile option, you can choose between a ‘rapid’ cycle (6 mins) and a ‘deep clean’ cycle (20 mins), giving you the flexibility to adjust your sterilising needs. The steriliser also allows you to easily recharge your portable Yoomi warmers on a separate recharge cycle. It has a similar base size as the Tippee but sits taller, accommodating up to 4 Yoomi bottles or 6 Tippee. I like its automatic shut-off feature and single button operation. The convenient digital display lights up blue so is easy to see when using at night. An electric sterilizer over a microwave a sterilizer is my choice any day. My favourite attribute of the Yoomi, simple as it is, is that the entire bottle basket can easily lift off the reservoir which I really like for cleaning and not having the condensation drip out. The 3-1 Yoomi breast pump is the perfect changing bag size, lightweight, quiet, perfect for mums on the go. Thanks to a portable USB adapter and battery pack mums can pump ANYWHERE. With every choice covered, as well as a manual option, it is a versatile choice! It has 9 speeds and a stimulation stage then a gentle sucking action to mimic babies feeding rhythm for more effective expression. It is easy to assemble, flexible, made of soft silicone for comfort. With a one touch pump and digital display a seasoned expresser could probably figure it out without the instructions! Have you got any of the Yoomi products or have you heard of self-warming bottles? Note: We were kindly gifted with the sterilizer and breast pump for the purpose of this review. This is just what I need, I will be starting my breastfeeding journey any day now!